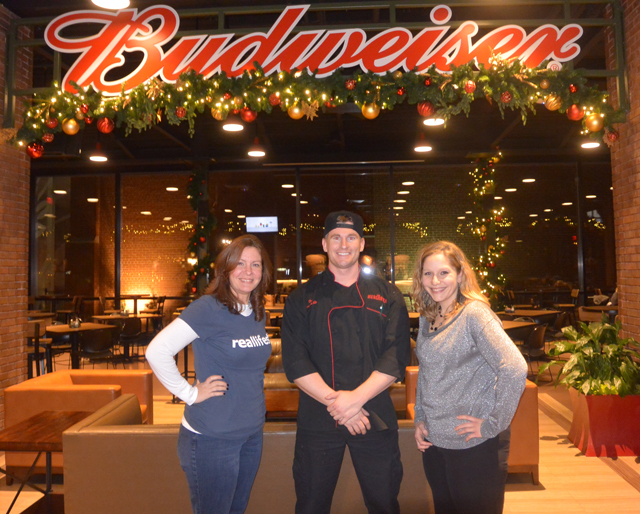 You may have read about our team’s fantastic experience touring the Anheuser-Busch Brewery on the Beermaster Tour. Originally, I was going to share the whole experience in one post, but that really wouldn’t have done either one justice. The Biergarten functions both as a fitting end point to each Brewery tour as well as a stand-alone restaurant and a fantastic spot to have your next family or corporate event. Our group was lucky enough to tour on the day that chef Travis Odle and his crew debuted their new winter menu. The Biergarten features two main dining areas as well as an extra room that can be utilized for private events. The inner area seats 300 while the outside area, which is gloriously covered and heated this time of year, seats an additional 300. Well known St. Louis artist Phil Jarvis created some amazing paintings on the walls of the space. Odle comes to The Biergarten from the fine dining culinary scene. He most recently worked at Herbie’s Vintage ’72 in the Central West End neighborhood as the sous chef to Chris Ladley. Odle is a very well-spoken chef and his enthusiasm for the food and menu shines brightly. As far as seating goes, The Biergarten is pretty massive and Odle loves every seat. He spoke fondly of being able to have several large corporate gatherings going at once in separate areas and having his team rise to the challenge. By the same token, he relishes in the tourism aspect of the space. He is keenly aware that many of his daily customers, especially in the summer, are visiting the area and he wants their dining experience with him to be a highlight. He knows he doesn’t have the relative cushion of a customer who had a less-than-stellar experience coming back next week to try it again. Odle speaks proudly of guests he knows that make it a point to hit The Biergarten each time they are visiting St. Louis. 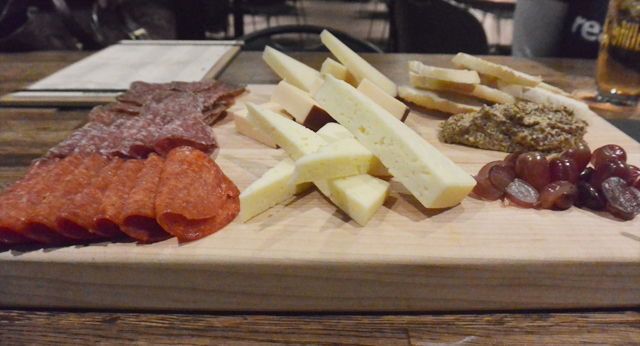 Our dining experience started with a tray of meats, cheeses, and pickled grapes. Odle explained his process of pickling grapes and we were delighted with the product. A Charcuterie Board on the menu is listed at $9. Bavarian Pretzel Sticks were next out of the kitchen. Sadly, pictures do not exist of this course as they looked too delicious for our group to pause. The soft pretzel sticks are flash-fried and served piping hot. They come with a Shock Top mustard and a Bass Ale cheddar sauce. Shelley and I both agreed that the cheddar sauce was simply amazing. Next came the Harvest Salad. Odle said he first came up with the Michelob Ultra cumin vinaigrette kind of by accident and then built the salad around it. 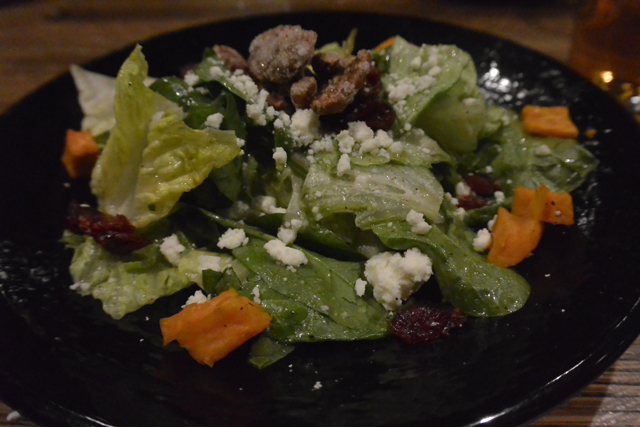 The salad features candied pecans, crumbled feta, romaine hearts and baby spinach. Several salads are available on the menu, all priced below $7. After the salad came a soup that one in our party wanted to “carry around in a thermos all winter long.” The Butternut Squash soup came out looking perfect and tasting perfect. Odle had mentioned earlier that with the volume this restaurant does, he doesn’t get to do some of the fancier things he would in fine dining. 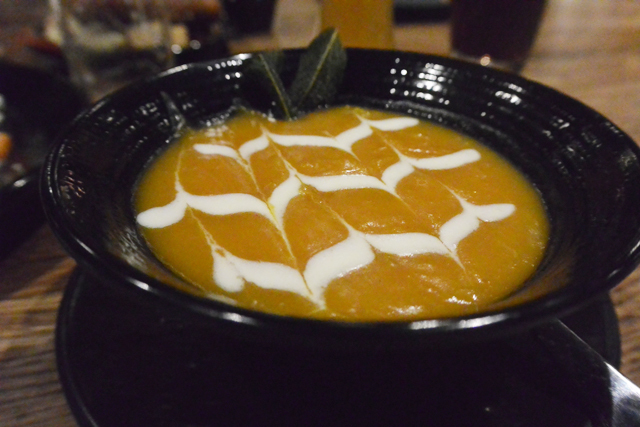 The design of the crème fraiche on the soup certainly impressed us. A piece of fried sage is also included. The next course we sampled was The Biergarten Burger. Odle uses an 80/20 mix for the patty and tops it with the Bass Ale cheddar sauce and thick-cut bacon and onions cooked in Budweiser Black Crown. Burgers are part of the Heartier Meals portion of the menu and come with your choice of parmesan dusted fries, coleslaw or potato salad. The burger we had is listed on the menu for $8.50. Odle said his kitchen goes through between 1,100 – 1,200 pounds of fries per week. Budweiser-infused ketchup is available with the fries. There are several other ingredients mixed in the ketchup, but Odle wouldn’t divulge those as he said there are some things in the works with it. The next course was the Flemish Stew, which is also on the Heartier Meals portion of the menu. 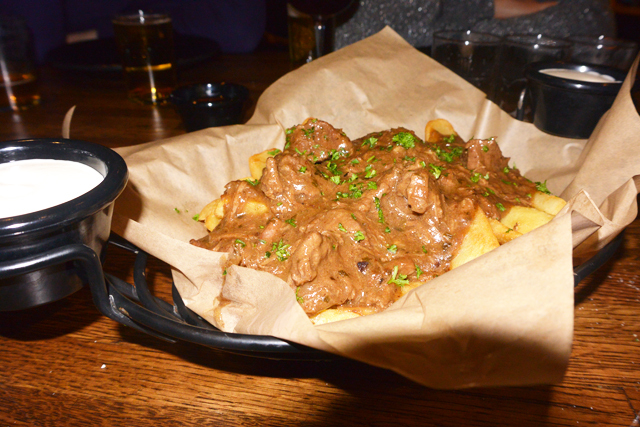 The Michelob Amberbock braised beef is served over thick-cut fries with a side of Bud Light-infused mayo. The mayo had a very unique zing that went extremely well with the dish. The Flemish Stew is listed at $8 on the menu. By this time, our stomachs were full but our mouths still managed to water thinking about what the chef had in store for us for dessert. Travis Odle did not disappoint. He brought us not one, but two samples of his dessert dishes. The Campfire Brownie is made with Shock Top Shockolate, which also was the beer paired with dessert. Graham cracker crumbs adorn the brownie while a toasted marshmallow is set on top. The Bread Pudding is made with seasonal beers and topped with a generous amount of chocolate sauce. The Biergarten at Anheuser-Busch is a great addition to the already iconic grounds and Chef Travis Odle has gone above and beyond to make the food an amazing addition to the experience. The Biergarten is open every day at 11 a.m. It closes at 8 p.m. Monday – Thursday, 9 p.m. on Fridays and Saturdays and 6 p.m. on Sundays. 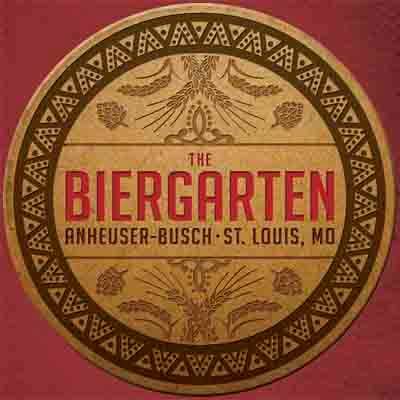 Directions to Anheuser-Busch Brewery and The Biergarten are available here. Plenty of free parking is available right outside the Tour Center. Call 314-577-2626 to schedule a special event or ask any other questions you might have. Enjoy expanded hours at The Biergarten as well as a special buffet during the Anheuser-Busch Brewery Lights Display this holiday season. The attraction opens Nov 20th at 6 p.m. and runs from 6-9 p.m. every Thursday, Friday, Saturday and Sunday until January 4, 2015. 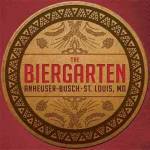 Be sure to check out The Biergarten on Facebook.